With only 13 days to go, the best thing I heard about the Remain and Brexit was: “Whichever way it goes…..we will live! !” Following the prize giving at this month’s luncheon, Stuart will chair a short debate on whether “Remaining” or “Exiting” the EU will best benefit us, and our businesses. Stephen took us through the joy, trouble, and turbulent times of running a business. An inspirational story of Passion, Resilience, Courage and a father’s wisdom. We had the update on our Business Date from Dominic Taylor, unfortunately Joanne Clarke was unable to join us, and however, we have been told business referrals are on the horizon. The May “Business Date Winners” of our free lunch at the Chewton Glen, was Jackie Neylon and Peter Hall. I hope they manage to meet and further their business connections, with deals on their “Path”? We are all looking forward to the 17th June when we have the opportunity to show off our sporting skills please come along and bring your guests for an excellent day. 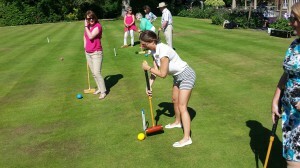 Stuart will have sent you further details regarding the Golf and the Croquet. For those who are unable to attend the morning sports, lunch will be as normal. I hope the sun shines for you! This entry was posted in News on June 7, 2016 by splice.